Did you know that in 1939, a particular author, Mr. Wright, thought up a book 50,000 words long without using a symbol following "D" but prior to "F?" This author of "Gadsby" took pains to lock stationary this symbol button on his typing apparatus so it wouldn't work. That's just crazy! How could such a notion occur to him? I know about a Franco book without this symbol, La Disparition (1969). In 2009 a translator did modify a paraphrasing of that book into Dutch (I think that was also a hard job to do). 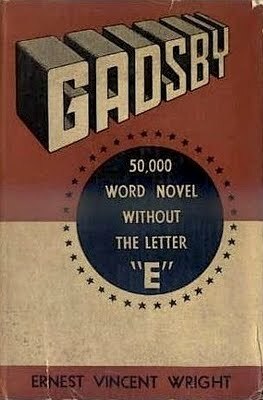 I didn’t know that this book about Gadsby was first. This Franco author also did pull out a book only using this symbol and the consonants! Too funny. I cannot imagine it was much of a book to read with a great story line. To M. in Wyoming, thanks, but today all of us must try to only print communications with A, B, C, D, F, G, H, I, J, K, L, M, N, O, P, Q, R, S, U, V, W, X, Y, or Z. For illustrations, look at Claudio and Rob from Holland's posts. Good job, guys! Bravo to all 'hommes'. You did good. I do not have vocabulary to do that. ha ha, I wrote 'hommes' to avoid writing male. Soooooo smart not to say clever. Valiant try, I say, my hat's off to all who hazard a crack at it! crazy. out of his mind. why would this author do this? mayhap I could try a book without "a" and find my soul on Oprah. @Rob I actually own the English translation of "La Disparition", which is titled "A Void". Clever works by author and translators.